One way to re-invigorate a room without breaking the budget is with a fresh coat of paint. With so many great paint choices out there, painting is a weekend DIY project that creates immediate results. Go ahead, let your imagination run wild and choose a bold new color to breathe life back into your home. We’ve got the painting 4-1-1 to help you paint like a pro. What Room Needs a Paint Lift? Before starting your project, think about how your room is used. Is it a high traffic area like a kitchen? You may want to be able to scrub stains and scuff marks off walls. Or is the room a little quieter like a bedroom? The type room you are painting will determine what type finish you select. Matte or Flat – Has no shine. Covers imperfections well but it scuffs easily. Good for ceilings. Matte Enamel – More durable, can be cleaned easily. Good for kitchens and kid’s rooms. Satin – Low sheen, can be cleaned often, shows imperfections. Works well on hallways and other high traffic areas. Eggshell – Subtle shine, cleans easy and can cover more surface area with less paint. Semi-gloss – Used mainly on trim, easy to clean. Gloss – High shine, shows imperfections but easy to clean. Takes longer to dry. Give yourself room to work by clearing as much furniture out as possible. Cover remaining items as well as the floor with drop clothes. Clean the surface of the walls and ceiling to remove any dirt or dust. If you spackle holes, paint them with primer to help them blend in when painted. Paint the ceiling first then the walls. Use a 2-inch angle brush and 9-inch roller and shallow roller pan. If you have a smooth ceiling use a roller with a smooth or medium nap. For rough ceilings use one with a thicker nap. Wrap new rollers in masking tape then remove to eliminate any loose fuzz. Cut in – Paint a 3-inch strip around the perimeter where the walls meet the ceiling. Work in small sections – Lap marks result if you allow the strip to dry before the roller can go over it. Use primer paint – It will help cover up stains and imperfections. Roll paint on in “W” pattern – Work across the body from left to right to avoid neck and shoulder strain. Fill in the pattern – Apply paint in even vertical strokes, overlapping the 3-inch strips to blend in paint. Outline corners, windows, outlets and finally baseboards – Don’t get too far ahead so the outline remains wet for the roller. 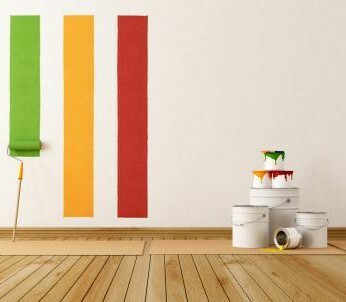 Paint from top to bottom – Roll paint on from the ceiling to the floor to cover any drips that may happen. Paint molding last – After the walls and ceiling have dried, apply painter’s tape to the wall or ceiling and paint the molding. Is a Paint Sprayer More Your Speed? If a roller and brush are slow for you, try using a paint sprayer. Just make sure to completely cover anything you don’t want to get paint mist on (including yourself). For more helpful hints check out our past blog on how to properly use a paint sprayer. After the paint has dried and the furniture is re-arranged, take a step back and look at your new creation. Fresh paint can brighten the spirits as well as a room. You’ll be able to brag about this until your next DIY project. Take a load off, you deserve a break. Whether you need ladders, vacuums or paint sprayers, our expert staff is always on hand to help you find the right equipment to handle your home painting projects. As always, if you have any questions about what to choose, pricing or how-to’s, don’t hesitate to contact us. Stop by our store — we’re open seven days a week.